The Movember Foundation is working tirelessly with an urgent goal in mind: accelerating breakthroughs in prostate cancer research that will benefit patients and their families. Movember is achieving this with the formation of the largest, global alliance of prostate cancer researchers and clinical specialists, who are tackling the toughest prostate cancer challenges. I had the privilege of hearing the updates on the research they have been sponsoring last week at the PCF retreat. More progress in the last 5 years than in the previous 25. Take a look there for updates/posts yourself! I need your support to fund this important work. Together, we can create a world where no man dies of prostate cancer. You can learn more about the important work and impact Movember is having at: http://us.movember.com/programs. There’s a lot riding on this moustache, thank you for your support! Use of calcium supplementation is commonly discussed regarding the side effects of androgen deprivation therapy (ADT). ADT and menopause share the phenomenon of accelerated calcium loss from bones. Numerous studies demonstrate that men who are placed on ADT lose from 2-4% of the calcium in their spine during the first year of therapy. Because of this, and the general phenomenon of low vitamin D levels in all of us who use sunscreens more regularly, we recommend that men take vitamin D and calcium supplements when we start ADT. The results of calcium loss are an increase in the risk of fracture. For example, in a study published in 2007 on 8577 men with prostate cancer who had similar fracture rates prior to treatment, the use of ADT increased the fracture rate from 14.6% to 18.7% over a 36 month observation period. Critiques of these kinds of studies abound. For example, the men who received ADT had more metastases and poorer health in general. Beyond that, in my patients, there is nothing close to 15% of men whom I follow for 3 years who have clinical fractures. How are these determined? Many times it is due to the increase in bone scans and x-rays which may pick up clinically insignificant fractures. Nevertheless, the fact that women in menopause and men after drug-induced andropause have increased calcium loss and fractures is well-established. It is also true that pharmaceutical companies have come up with effective drugs to combat this phenomenon – notably bisphosphonates (like zoledronic acid) and antibodies (like denosumab). An example in men on leuprolide can be found here. In all of these kinds of studies, the placebo/control groups were given calcium and vitamin D.
A mild controversy in this arena arose when publications pointed out an apparent increase in myocardial infarction in patients receiving calcium supplements. In one such study, evaluation of 5 trials in which calcium and vitamin D supplements were randomly assigned to >8000 patients, there were 143 patients with myocardial infarction among calcium users compared to 111 in those on placebo. This has given rise to the concerns expressed by some patients about the safety of calcium and vitamin D supplementation. Although I am no expert in this area, there clearly are 100’s if not 1000’s of people who are (or who think they are). Ask them or read all of the literature (and DON’T miss clicking on that link…) you wish and reach your own conclusion. The recommendation for normal healthy adults is about 800IU/day of vitamin D as a supplement. You could start here if your concern is primarily about the heart attack risk. Or if you are most concerned about the fracture risk, start here. It is probably reasonable to know your 25-OH vitamin D level to be sure you aren’t deficient. 1000-2000 units of vitamin D/day seems like a reasonable supplement dose in patients who aren’t deficient. You should probably avoid calcium over-supplemntation if you have a history of kidney stones. Avoiding milk products may make sense (see this blog), so taking 1000-1500 mg calcium carbonate (chewable tums or equivalent) daily seems logical to me in patients on ADT who should probably avoid dairy products anyway. The scientific writers of articles for radio, TV, and newspapers seem to love to write about supplements and cancer. There are good reasons for this. Studies have shown that well over a third of cancer patients start taking dietary supplements after their diagnosis. These studies generally find that the practice is more common among women than men, among more highly educated patients, among older than younger, and is highly correlated with indices of patients wanting to have more control. Thus, a study that purports to find that some easily available dietary product slows or reduces cancer is bound to find a wide audience – after all, more than 1 in 3 of us has a personal relative with cancer or have a cancer diagnosis ourselves. Moreover, we are dealing with an industry that generates $27B in revenue in the U.S. alone. This week’s literature provides two additional “newsworthy” examples of the phenomenon. In a huge study of physicians over the age of 50, with high compliance in taking either a multivitamin or placebo, there was a reduction in the rate of developing cancer. Of course when you get 14,000 men in a study, the ability for statistics to pick up a small difference may be too powerful. In this case, the reduction from 18.3 cases per 1000 person-years to 17 cases is certainly not very high. As I have often said in this blog, the eye of the beholder is critically important in deciding whether something is meaningful. For those with a discerning eye, they will note by reading the link to the PHS II study, that there was no difference in the rate of developing prostate cancer. For the record, I participated in the study and I received a letter this week stating I was on “active” multivitamins. A second story making the rounds at present has to do with green tea. The UCLA group evaluated 34 men who drank 6 cups of green tea daily prior to prostatectomy and compared them to 33 men who drank only water in the same quantity. They found that PSA values declined and that some of the markers of prostate cancer cell proliferation changed in a healthy direction. This is but one of a long line of studies from this group indicating a potential positive effect. However, jumping from this to whether YOU should be drinking green tea in such prodigious quantities is another matter altogether. Before you buy any of the “we’ve found the answer” type of articles found in the lay press, I always suggest doing your own research. MY suggestion is to do this at Google Scholar. If you enter “tea” and “prostate cancer” you might find some surprises like this one which showed increased prostate cancer in tea drinkers in Scotland. However that was black tea probably, and for the most part, the green tea story seems to be a valid one. I’m just not sure the difference in things like molecular markers and PSA will really amount to anything in the way of improved survival or actually slowing the cancer down. You could say, “yes, but it can’t hurt”, in which case I would be very cautious since studies of this sort seldom look at interactions with things we know DO help. For example, what would the effects of drinking lots of green tea be on abiraterone, or on enzalutamide, docetaxel, leuprolide, or on your immune system. Mostly unknown. Still, I generally tell my patients that low fat diets, lycopenes, pomegranate juice, and green tea all have some studies supporting their use. And for the most part, many patients try these, but we really don’t know which, if any, patients really benefit. Like all (or most) prostate cancer docs, I have routinely recommended calcium and vitamin D supplements for men going on androgen deprivation therapy (ADT, “hormone treatment”). The reason for this is that many studies show that men, just like their wives/girlfriends, start losing calcium from their bones as soon as testosterone levels drop – the equivalent of menopause and loss of estrogen in women. Of course, medical history is filled with examples of well-meaning interventions for patients that actually don’t work, even though they seem logical. One of the more commonly cited examples is the Vineberg procedure, in which cardiac surgeons re-routed arteries from the chest wall into the left ventricle in patients with coronary artery disease. Makes a lot of sense – the heart muscle isn’t getting enough blood, resulting in angina, so “fix it”. The problem is that it was never properly studied, and when it was, it didn’t work any better than sham operations in reducing angina. There may have been some benefit, but by the time proper studies were done, bypass grafts had overtaken the approach, and now this has been replaced in many cases by stents. For now, I don’t think I will change my recommendations, and like the articles on coffee drinking, or alcohol intake on heart disease and everything else that goes wrong as we age, there will no doubt be lots of counterpoints. The “vitamin D believers” all will tell us that we need to be taking even more vitamin D and the evidence that vitamin D might slow the development of prostate cancer is reasonably solid. In any case, if you have significant heart disease, this article might be something to discuss with your cardiologist, if not your oncologist. Why is it that this topic is so popular among most patients? I think it is because we have some sort of intrinsic belief that cancer has been caused by our not eating the right things and that (as Americans…) we can fix almost anything by taking a pill or altering our diet. I’ve got some news for you/us – it is probably true that diets have an effect on cancer development, but it is most likely over a lifetime, not in the 3 months of “whatever comes next” in our struggles with an ailment. I’m as guilty as the next person in not eating enough vegetables and in liking the taste of a fine New York strip steak, so consider this a missive from the “do as I say, not as I do” camp. I have written in this and the old blog (link to the left) several times about multiple vitamins. 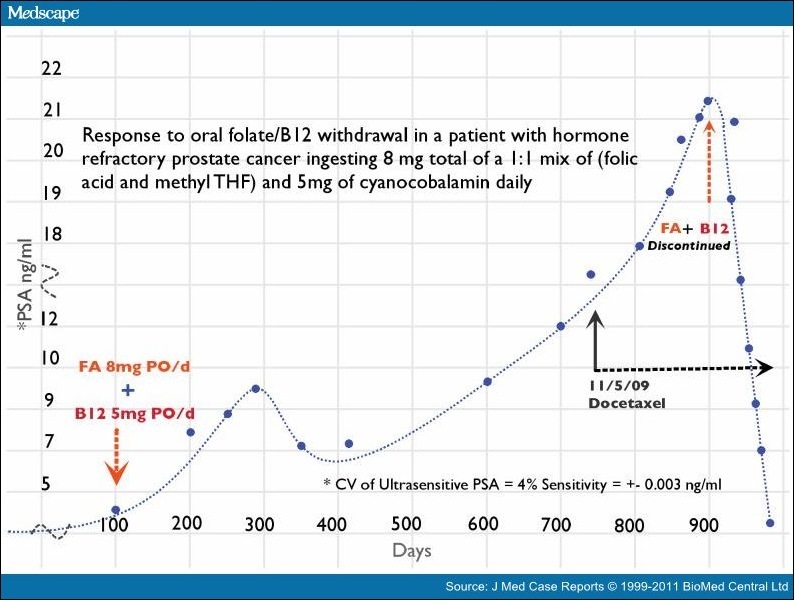 I was inspired to write this blog because of an article that appeared in Medscape today on pretty dramatic changes in PSA in a patient who stopped taking folate and B12. The figure above (reproduced without permission) shows a pretty dramatic effect. The fact that the patient was on docetaxel the whole time may also have something to do with it, but it is hard to make a story out of a single patient. The authors of this article referenced a study you can read here, in which men who received folate supplements over a ten year period had almost a 3 fold increase in prostate cancer. My thought is this: when your friends or neighbors tell you that there is a new supplement you can take, or a new diet, or a “detoxification program”, for the most part there are NO studies to support the claims. Worse yet, our baseline feelings of “why not, it can’t hurt anything” may be terribly wrong as illustrated by the study and the figure above. My advice really isn’t very different from others. The core things about diets that I think have merit are low fat, high soy, great exercise, and balance. In terms of supplements that have been studied, I tend to think there are a FEW patients who may benefit from adding lycopenes, pomegranate juice, perhaps green tea extracts, and fish oil. (the latter also made the news last week and you can read about that here) The best thing to do, however, may be to eat a balanced diet and avoid most supplements. The ones I list are generally supported by only one or two trials. Don’t forget that 15 years ago, everyone was touting selenium as preventing prostate cancer based on a single study. A subsequent study of selenium, vitamin E or both found no effect unfortunately, and the update actually showed that vitamin E supplements increased the risks. Happy Thanksgiving and enjoy a bit of turkey and your family. Most of us have lots to be thankful for, even if we are fighting an uphill battle with prostate cancer whether as patients or physicians!